Gedab News learned that several companies of the Eritrean army are being hallowed at alarming rates. Due to serious desertion of conscripts, many squads ceased to exist and platoons have been downgraded to the level of squads. At the same time, the size of companies has decreased to that of a platoon, in some instances to a lesser size. Meanwhile, the weekly and bi-weekly drill the peoples’ militia was supposed to go through has almost stopped. Farmers and herders have gradually stopped attending the compulsory weekly or bi-weekly drills that were a common sight around the countryside until last year. Recently, the militia army has all but disappeared from the scene. Citizens have just stashed the arms that were supplied to them by the regime and are going about their work tending to their farms and herds. In cities and towns, some militia personnel are still required to do night guard duties. Until last year, the standing militia army numbered approximately 150,000 people who were assigned to different policing and guarding tasks. The life of the weakest sector of the society, farmers and herders, has become abysmal while those who do menial labor and engage in petty jobs to survive have been thrown into destitution. At the same time,life has continued to be difficult for Eritreans due to taxation and other moving regiments imposed by the government, on top of the widespread corruption, mainly bribery which has become rampant. The army is in a crisis. It has also been plagued by desertion to the extent that members of the army, mostly conscripts, have returned to their units after a leave or after an assignment, only to find that their units have disintegrated. They are usually told to return home and wait for further instruction. Many conscripts, including junior officers, have disappeared inside the country or escaped across the border to Sudan and, to a lesser extent, to Ethiopia. For the last six-months, the army has been in disarray after President Isaias Afwerki announced his intentions to restructure the Eritrean defense forces. Developments in the army have become the main news that people are talking about in Eritrea. Particularly after the posthumous promotion to army chief of staff of Major General Andemariam “Wuchu” who died several weeks ago. Major General Wuchu was being receiving medical treatment in Eritrea and Sudan before traveling to Italy where he stayed for a considerable time. Giving up on his recovery from his serious illness, Italian doctors decided to send him home to face his fate. He returned to Asmara on a chartered plane accompanied by an Italian doctor who immediately returned home after escorting General Wuchu who arrived on a wheelchair. Eyewitnesses who saw him at the airport said he looked haggard, tired and had several glucose and other intravenous lines connected to his body. He died a few weeks later. Eritreans discovered General Wuchu’s promotion to the position of the army’s chief of staff when his bio was read at his funeral. The Eritrean regime doesn’t inform the people even about major changes in the government. Nearly a week following the death of General Wuchu, Eritreans came to know that Major General Philipos Weldeyohannes was promoted to the rank of full general and appointed chief of staff of the Eritrean army. The Eritrean army never had lieutenant generals or major generals directly become full generals. In all state funerals, General Sebhat Ephrem, the defense minister, used to lay the wreath on behalf of the Eritrean armed forces, but at the state funeral held for the three veterans who died two weeks ago (Brigadier General Amanuel Haile (aka “Hanjema”), Brigadier General Mebrahtu Tekleab (aka “Vaynak”), and Mr. Desu Tesfatsion,) it was General Philipos who laid the wreath on behalf of the armed forces. In a related story, a few junior officers of the Eritrean army have been promoted to the rank of Brigadier General, Colonel and Lieutenant Colonel. At the same time, at least three senior generals have been assigned to civilian positions by the president of Eritrea. According to our sources, at least two of them have refused to accept the assignment. It is expected those who refused to take off their military suits will be frozen with no roles to play either in the army or the public sector. So far, after the two generals refused to accept the assignment, the position of governorship of the central region remains vacant. As usual, when it is filled, Eritreans will know through the grapevines since the government doesn’t provide timely information on such appointments and promotions. eritrea —– 4.7 b ————– 3.47 b ———— 4.7 b —– 600 us d —– small. dine, My friend what are you trying to say? Look, it is not what you have it is how you use it. it doesn’t matter if the population and the land is bigger or smaller. the reality is Ethiopians are doing fine due to their system. Eritrea is not doing fine due to PFDJ (the group with out system). Eritrea is reach enough in natural resources with very much hard working people. this is additional to it’s strategic position geographically. it’s a mater of time and it will become prosperous nation. now the cooperation between the two sister nations will give them more space to make them strong in this fast developing globalization. i know for sure Eritreans will do fine when they have the right understanding of eritrea and a right system, though i was responding to her ayda. -First, I hope you understand,as I do,that we are on the same page but with some disagreement and with different approachs. Therefore,I would expect you either to shut up about the Weyanes at all or to admit their devastating contribution to our current mess. As to the PFDJ sins,you tried to count,in fact your list is so incomplete that you even have no clue that I might have been the victim of all the sins you tried to mention,as a Citizen,professional and business person..
We are victims of all kinds from all corners, both internal and external—and we have to fight agianst all,not just PFDJ. -When I visited Eritrea in 1992,my own Aunt,Senior EPLF member was mad at me as to why I am here and she brutally told me that as a professional and intellectual,I have no place here and that I better go back to where I came from. -She openly declared to me that —the regime will not tolerate,the YOUTH,Intellectuals and successful business people.—You can see here that the strategy has worked for DIA beyond his expectation when it comes to banning the Youth,Students,Intellectuals,business people–etc—a perfect prophecy by their own Teghadalit,who might know the system. My point is that the strategy to make the Youth to suffer and flee the nation –has been an old tactic.DIA himself made a point saying : ” Let them try what we want through”–during the border war.Meles Zenawi–re-iterated this during one of his interviews. Case in point,the Asmara Univ Students saga–is a living example—besides keeping the Youth and the Students away from him–a practical definition of paranoia. When I came back to visit Eritrea in 2006,I was driving through Keren and stopped to visit a sick family member in the Old Keren Hospital.When I was trying to leave the Hsopital at around 3am,I noticed lots of white stuff and when I asked what all this is about,my cousin told me that these are sick people waiting for am Doctor Visit.But I said that is too many people and he laughed telling me that this number is in fact very small–at 3am! My point is the health Service was way bad–expectedly though for a new country with a devastated infra-structure. The next morning,I visted one of the Government branches–Health Minstry and I offerred them if I could open a comprhensive Clinic that includes both Adult and Pediatric(children) Clinic, OB-GYN(Womens’),A modest Lab,Imaging Center, Pharmacy–etc, in keren and other places,which may need urgent help. I cursed my self and left the country.Until 2009, Keren Hospital did not have basic and essential Lab machines. So–that is why I am asking not to tell me this and that—and I am NOT PFDJ supporter but I disagree with some approaches you are prescribing me . I have to respect your chosen approach. I too have my own. Mine is also born of very intimate knowledge of the nature of the regime (down to the nature of individuals afflicted by its mentality). Many of the things I came across, I don’t write here (this being a public forum). However, I am certain in my mind that nothing short of total dismemberment and hence dismantling of PFDJ would do for our nation. They are indeed poisonous and destroyed a beautiful nation with tremendous potential. All efforts must be deployed to completely decapitate it, kill it and burn it for good. I see great nation of Eritrea arising from the ashes and debris of the demolished HGDEF. Its evil stench might linger for a while but would sure dissipate and be no more. The Eritrean people have been exposed to the worst form of humiliation and brutality under the evil PFDJ. Now, Eritreans are determined to have a formal severing of their involvement with this evil entity. Today’s buzzword that reverberated from the Holot detention center was “ንስለ ሓርነትና ዝኾነ ይኹን ዋጋ ክንከፍል ድልዋት ኢና።” If Eritreans can rid off PFDJ quickly with as little bloodshed as possible, then that is an achievement in itself. If there is an international or regional conflict you are trying to fight against, then that is a matter of war and needs to go through Eritrean parliament and decisions of an elected government. Sorry, I can’t buy BS from evil PFDJ, not today not ever. If there happen to be eminent danger from Ethiopia or any other party, the nation would examine the nature of the threat and undertake the necessary action. Under normal circumstances, Eritreans are patriots and are capable of defending themselves if need be or working productively with the region as situation permits. PFDJ is a parasite and the only thing it is good at producing is a heap of lies and venom of hate. It has NOTHING to show for 23 years apart from death, exodus, poverty and misery as well as a tall list of entities (some dead and some alive) to take the blame for its useless and parasitic existence. We are only entitled to wage war inside our country for our own rights, we can’t wage war against outsiders. That is a different ball game and requires a different set of legal procedures. Eritreans (many) are now opting out of any association with the evil PFDJ and would seek a formal separation. WOLADAY; what you re saying does not make any sense. Eritreans flow to tigray and Ethiopians flow to Eritrea. that nothing special. The Ethiopians who flow to Eritrea , what the dmht. what are the amahar.? they flow to Eritrea as well. kiserqnei kelo zireakuwas neti ziserqo kimelsely kelo zyamnon. ” we never ever will trust woyane and most tigrayans can do good to Eritrea. Never in a century. They deported 80,000 men, women, children, the sick, preists, old , pregnant women, bBIES SPEARATED FROM THEIR MUMS. HOW DO YOU THINK WE CAN ORGET THAT? wOYANES AND THEIR CADRES CONFISCATED THE PROPERTY OF EVERY ERITREAN THEY DEPORTED. tHEY DEPORTED PEOPLE IN THE MIDDLE OF THE NIGHT ON THE PYJAMES THEY HAD ON. How do you think Eritrean people can forget that the woyanes ransack Eritrean properties and have made a living from the stolen wealth.? how do you want me to believe you Tigrayans help Eritreans( ther may be some good individuals in tigray who were not involved in the crime of deporting eritreans, or stealing Eritrean properties) but in general tigrayans are enemeies to us. If they were not enemies why did they deported the 80,000 in the mid night and with out giving them a day or two to pack their clothes? if you anserwer this questions, then you will convince yourself ywhat you have been saying is dead a lie. Do you know how many Ethiopians were inhumanly deported from Eritrea in 1991? You talk about the 80,000 Eritreans who chose independence in the 1993 referendum . According to the late elf leader Ato Ahmed ( rip) , that is only 20% of all Eritreans in Ethiopia . The rest are still there and we get more and more every day. You can blame and hate amara woyane ethiopia derg USA UN ….. As much as you like but you can’t change facts . Writing long propaganda can’t make any truth! Everything that you wrote is PFDJ fabricated propaganda! What had happened was, Eritrea lived in 7 years of its independency, a 7 years looting Ethiopia…! Ethiopia must stop the looting! What Ethiopia did first was advice PFDJ to limit their looting, but PFDJ didn’t know its limit ….in all these advices, journalists , politicians…. Were following closely.,..! Eritrea printed its own money & so on. Eritrea must use dard currency to but things from Ethiopia & vice versa! Isaias tried to intimidate Ethiopia , but the leaders in Ethiopia have never been intimidated in their entire history, so after a while the only choice Isaias has is to hold Eritrea & it’s people on the neck! To help his planes , the first thing he tried was attack every neighbor so Eritrean will have nowhere to go! & finally he invades Ethiopian torritories & therefore he put Eritrea where it is now, but some Eritrean repeat PFDJ’s propaganda purposely created to conceal the truth! Remember: Badme had never been part of Eritrea neither during the colonial era nor during the union time! Isaias created Badme to keep you under control of his fabricated propaganda, & it worked perfectly! The reason of these deported is for security purposes! After the deportees, there are over half a million left in Ethiopia! But many Ethiopia in Ethiopia was lost forever & nobody knows the were about of them! We will find out when Eritrea is refreed against from the jaws of PFDJ! If only Eritreans own more this type of sites, the change could have been completed earlier. Yes because change comes from elderly men reading long articles online to only write even longer comments. Keyboard activist to the rescue. Make sure you ice your fingers after each and every battle. and what, success is only to be found within first. you don’t have to give nonsense reasons for own crimes and mistakes. hey, PFDJ is always blaming “Weyane” and most of supporters are hostage of this reason. But Ethiopia is growing working within herself. It seems to me they are cooperating (directly or indirectly) to let Eritrea a failed state. but we can’t blame still Ethiopians they are just doing their job -building their nation and we should solve our problem. u said PFDJ is always blaming ”Weyane”. for ur information PFDJ/EPLF is always blaming ETHIOPIA since its creation so i don’t wary about them for blaming ethiopia/weyane because as long as ethiopia keeps strengthening and prospering, EPLF/PFDJ will give it up blaming Weyane, if not they will be harmed more . and i think that is how the world politics works the big(economy + military) is superior than the small so who ever loves eritrea better know this. “…..is superior than the small so who ever loves Eritrea better know this.” you can imagine if this strong mass of Eritrea owns a government that really functions how much cooperative is. you know how much creative people are, hopefully soon we will reach to the level our sister country reached. in fact Eritrea is suppose to be more advanced. even when the two countries cooperate there will be unexpected development in horn. that is why I always say -HORN, HORN YOUR HORN. ”you can imagine if the strong mass of eritrea owns a gov of its own” i heard that in 1980s-90s,INSHALLAH one day eritrea will have functioning gov, when you do, remember the 1st grade education which say the big is superior than the small. by the way did u say you horny of what. Mengiustu Hailemariam declared to the Ethiopian people,after the demise of the Nadew Command, that the EPLF/Eritean people is “liyu Fitret yehone be sahel terarroch Atomic Bomb eyesera new”:The EPLF/Eritrean People are unique and they are on the process of buidng an Atomic Bomb in the Mountains of Sahel”. Without exaggeration, the fear of the western power is that this kind of unique people might be a “bad” example of good things to Africa, that may affect their interest. i don’t know the drug you taking or the drug you need to take but do something. I can see the difference you have both you and hope. Hope lost in PFDJ camp. and you are lost of dreaming in getting back Eritrea. I am here supporting Free and democratic Eritrea. now love it or not this is what we Eritreans want. I love the way Ethiopia Developing and I hate to see Eritrea failed state. I believe I should be part of the solution by changing the regime. any objection? dine what id you say. why is a strong Ethiopia cannot feed its people, make peace with its people, be independent rather than remain a servant country, a beggar country? why woyane cannot be better than Hailesleassie and derg where hunger, famine, catastrph has be come the mark of their governments. woayne has made it worse. there are 20,000,000 people with no food to produce an become famine victims, 2000,000 are beggars in towns and cities all of the country( addis ababa only accounted for 100,000 children begging on the streets of DDIS. wE WANT TO SEE Ethiopia FEED ITS PEOPLE A MINimum 3 meals day and then you can say strong. Ethiopia dependens 3 billion aid from western msters. ~ its military, and office budgets are covered by the USA and other donor countries. what does mean strong then, ?? Your name is Kokhob selam and you are telling me that the Ethiopinas have the right and are working hard to let Eritrea fail? On the same token you are telling us–PFDJ supporters,that we are blaming weyane? Silent and an undergorund Weyane agent? Well if they have the right to make us fail by any means possible, we the ight to blame them too. The Haile and Kokhob Selam Project? They are working day and night as they love their country, they didn’t give any damn reason saying PFDJ is against us and we will stop functioning. they didn’t victimize their people . IA has done everything possible to destroy weyane in the last 40 years, but he couldn’t! Is blocking the trucks carrying food to help the famine in Tigrai a helping Tigrians? Is cooperating with Derg to destroy weyane considered helping Tigrians? IA & his cronies even refused to train & arm them well! What are talking about? IA’s damage to the Tigrian struggle is more than his help! I don’t think if we can go along in anyway! As I said earlier, you guys are discussing about the fabricated propagandas that IA created to cover up his real intentions! Badme had never been part of Eritrea at any time in the past , & will never in the future! You are just watch until too late! For me there is no point to discuss here at all! You have better to discuss the real matter than following a fabricated propaganda! Remember the young student of law who asked IA …. & IA is infuriated while collecting papers on his desk, where is that young man now? That’s when IA intended to destroy Eritrea! Weyane had nothing to do with the border war or anything with today’s Eritrea! Good lack! You talking about weyane sitting idle! Ethiopia’s success is good news and only the disturbed mind would have a problem with it. Why should I not be happy if more Ethiopians are getting better opportunities and what have you? So long as they feel they are making progress, I am happy for them. Now, what exactly make you I think differently about the Badem issue or the whole matter regarding the border conflict? Could you give us a link where I announced that? The border issue or any other issue is unthinkable to be resolved under IA, but all the agreements are valid even after him and it is best that an elected government decides on our behalf from Eritrea’s point of view. Please don’t assume that people having good will and brotherly outlook towards you translates to their support of your position even at their own expense. The opposition is not willing to entertain engaging in the border issue, the regime has failed to earn the trust and respect of the inl. community and we have a crisis in Eritrea that needs urgent attention. Even the Ethiopian gov. doesn’t publicly declare to overstep the the mark and threaten or attack the country because it has been temporally weakened. They know better that the Eritrean people are far better than this under normal circumstances. Whatever you do, don’t confuse force with legality. Elected governments in both sides might one day resolve the matter to satisfaction of both peoples. If so, then you are admitting that the people of Eritrea should suffer indefinitely as long as IA is alive,which is the norm and modus operandi of the day by the weyanes and its masters. At times,your mouth is full of shxxt if you are paying attention to what you are saying. Hating IA should have nothing to do with keeping hostage the Eritrean people. You see, you keep contradicting here and there.You know the big picture but you are just obssessed with hating IA rather than looking for a comprehensive solution. You know the trick the Weyanes and its masters have been using ,which you seem to accept,is to frustrate the Eritrean people by cornering IA and keeping us the hostage of this demarcation and No Peace,No War status,which in turn has contributed to the exodus and the suffering of our Youth,an issue you are “fighting for”. As to the Ethiopians, since when do you believe that they have been in our side?Why do you even waste your time responding to their old new ghurra? Yea,I know, they are keeping our refugees in their camps, they are allowing few of our Youth to join their Colleges–bla–bla—-but NOT for free though, as the corrupted UNHCR is paying them a big chunck of money in the name of our abused refugees,which you do NOT want to talk about. Keep your success to yourself then and leave us alone and do NOT take us and keep us as hostages with the support of your masters..
that is exactly what ethiopia is trying to do, to keep the success to herself. Swallow the bitter TRUTH though–and that is the TRUTH but the TRUTH. It was the OAU and now the AU,which has allowed your Weyanes to destroy Somalia and now Eritrea. You know, may be Mekuria is held against his will. Who knows? NEVER! If You couldn’t understand me that doesn’t mean I am responsible for your misunderstandings. I said the opposition needed to have a clear stand regarding the resolution of the border. It doesn’t matter how but just a clear stand that the Eritrean people, Ethiopians and the world can understand. I even suggested one where Eritrea enter dialog and negotiate on normalization, and the results of those agreements become effective following the border demarcation according to eebc. PFDJ is incapable of engaging in this manner but the people could see an alternative. You can dig that comment out. My point was clarity might help the people. Do I believe the same today. Not sure, my faith on many things as regards my fellow people has been shaken and I can’t put my money to bet that Eritreans can be helped by the resolution of the border alone. If you have a problem with woyane/EPRDF as an Ethiopian, that is your problem. Only the dirty dictator has ears for the internal affairs of other countries. Don’t use us for your problems. We have enough thank you. you don’t understand what am saying, you were stubborn about BADME and now as i see it you change your mind which is good, i believe the change in attitude comes because of ethiopia’s strength and success. if ethiopia keeps up growing like this a lot of you will follow you and YG,so don’t worry about the regime supporters.IT’S UP TO ETHIOPIA. regards to TPLF/EPRDF yes i have same issues (it is internal like you said) but in most cases (economy and other) i like them. So, I would suggest the “gobiye” to walk to reverse to the 1980’s – pre-independence era. Many agree governing under the derg era was much better than the current governing under DIA. The border war was never mentioned until 1998. After the border ruling gave it’s decision and the G15 got arrested, that is when the regime started using the border with ethio as excuse to erase its “akayida aba gobiye tetew elu sigab dob zihtsi”. If you don’t mind I have further modified your beautiful cartoon depiction. woyane, woyane crooked cries, we have more serious disasters to think about. To answer your question, no at this time. Until we have a formidable and all round organization, that will have a class of “clinical politics” not only to clear the “woyane addictions” but also help them from any withdrawal symptoms. if AU is in Addis Ababa, and you want to use it as your own organization n, that is not going to work for you. Eritrea is a member of the AU. It has its own mission in Addis Ababa. although the Tigrayans did not want Eritrea to have a mission, but it is a must, they have to allow it. After how many years denying Eritrea to be in the AU, meles was threatened the AU to move out of Addis abab and it has to swallow the bitter pill and accepted the demand from the AU members. With out Eritrea the AU is half cooked organization. Huh,yeah,the truth irritated you a bit,Mr. Medhanie Eyob.Had the AU been in Asmara, Africa could have benefited a lot and the Horn of Africa in particular,could have achieved a long-lasting peace and Somalia specifically,could have stood tall as a Nation.S Sudan would have not gone into the current mess. The IGAD could have functioned better—etc…. Why do you think the location makes that much difference? haile, you yourself were ”woyane” addiction a year ago (badme), if ethiopia’s growth continue like this believe me, not only the regime supporters even PIA himself will follow your lead. it’s up to ethiopia’s success. But you missed deliberately that most likely half or 1/3 of these figures might be Ethiopians as well. You also conveniently avoided the serious role of the crippling economic sanction to the mess.You avoided conveniently also that the sanction included the sanction on Eritrean Airlines–as confirmed by the same Lufthansa Air,begging now to fly to Asmara. You also deliberately omitted the role of the Weyanes in S Sudan leading to suffering of Eritreans there by deliberately telling us the Eritrean Gov was involved in supporting the Rebels,when you are fully aware as to who the culprit has been. This is a classis Meles Zenawi/weyane politics–lying and lying etc—Good student!! I Wonder how much Aboy Sibhat and Bereket are supporting you bro. the treatment you need. You can fight woyane when you are good and ready. Otherwise, they’ll kill you with a single blow. Period. Yours and your alikes’ DAY AND NIGHT PETITION might have contributed to Eritrea’s weakness as you clearly admitted. I am arguing for the sake of arguemnt though.What I said is FACT and do NOT tell me that your one sided “facts” are the only Facts. BTW,so,you are telling us that since we are weaker and they are stronger now,we will kneel down and justify their crimes. NO,I do not have the patience to buy you. Let’s blame all to be blamed and act against all of them. Now you are at the altars of real greatness. እንታይ ዋጋ’ለዎሞ ጸማምስ ሓደ ደርፉ ከምዝበሃል እንዶኾይኑ። This “hope”, unlike his name, seems to me hopeless. Do not forget also that the new open policy of the EU,”thanks to the lampadusa”incident,has helped further the exodus. Eritreans always need an enemy to unify them. Derg, amara, woyane ,USA , ……they are experts in creating an imaginary enemy .i don’t expect Eritreans to stop blaming ethiopia anytime soon .it used to bother me before .now I just laugh at them. An imaginary enemey? Are you insane or as usua,l applying the old new weyane propaganda? Can some one advise this person to read some history?Are you from Venus or something? Eritreans have only imaginary enemies?Please,AT,either block this guy or advise him to respect us and our history. Some people are “…. hopelessly uneducated no matter how instructed they may be ” Dale Carnegie . You are a perfect example. Ethiopia is not your enemy ! We are trying very hard to forget you . Find your enemy somewhere else if you must have one. We don’t have the time and desire to worry about you. Then forget us completely and go away and leave us alone.And who is forgetful and forgiving,BTW? “lease ,we Ethiopians have an obligation to ask our Eritean brothers and sisters a big time Forgiveness for what we ethiopians have done to them. You are the perfect example of what you quoted,rather,as you are insulting the intelligence besides being ignorant about a living history.If you did not exist,we would not have suffered this much. Next time when you get a chance remind the paster not to mix politics with religion . I’m sorry you are suffering however , we are not the cause of your suffering .we also suffered for so long just to keep you with us .now that you are gone we are enjoying life a little bit better. My advice for you is to find the right tree to bark at . This Sunday try an Eritrean church . I think there is one good medicine that can cure only to those innocent who couldn’t see the truth among supporters. you know what? if only Ethiopian government just decide to leave Badme, what that PFDJ could have done? kkkkk, they will have to pack everything and just find some mountains in SAHEL. You cannot erase the True and Living history. You can not force others to believe in your version of “true history …” You have no evidence you are just reapplying the same music that we have been listening from HIGDEF . Somebody has tell these IA supporters to stop propagating fabricated propagandas & concentrate on the real issue! IA wants Tigrian & Eritrean to be a permanent enemies using his fake border disput! This king of propaganda has been there for almost 7 decades! The Italians & followed by IA & his cronies! The Tigrayans chose to be permanent enemies of Eritrea and they will pay the price on due time. aye hope! “…pay the price on due time…! We all have 2 legs, 2 hands & a head on our top…! እንታይ ይባሃል ይመስለካ፦ መርዓስ ይትረፍክን እሞ ብሰላም ክረማ! ነቲ ሚኪን ህዝቢ ኤርትራ ዳኣ ለኪምኩሞ! You know this article is treacherous when it’s being posted on TigraiOnline. Congrats Awate you’ve officially earned the label of “sellout”. All these PDFJ fools keep talking about woyane or Addis Ababa for their issues instead of putting the blame on their evil leader..nuts..it’s like twilight zone…r they really Eritreans or from some alien planet?? City states? Lol do you even know what that means? Asmara and Addis are city states? Hahaha vibrant urban culture and socio cultural liberty? Boy oh boy….You are trying so hard to sound sophisticated. Thankyou I feeling sophisticated now ! and the citizens of the whole country in general. AREAS ” and their culture. You forgot to mention you started deporting Tegaru back in 1991 but Weyane started deporting hamasens in 98 and there is no such thing as Ethiopians of Eritrean origin .We got the deportation qualifiers data from bet tsihifet shaebiya.Those that we’re not card holders were not affected.and those that were deported are now returning back to Addis.If it was up to me I would hunt down every hamasenay and eradicate him.You people are sick and demented haters.Whatever we do for you,you turn it around and make it look like we Tegaru are after you.i understand it is your national duty to hate Tigray.i know that comes from your identity crisis and self hate. This is what the problem is , your DIA created the border war to crush Eritrean seeking democratic changes! The no-peace no-war was created by DIA…! I mean, how about of Eritrean journalists? Is it because of weyane? How about the check points in every corner of Eritrea ? Is it because of woyane? How about the freedom of movement,the constitution,…? Eritreans are saying that they were better off during Derg! of Eritreans before he knew that they did not need or appreciate his help whatsoever. TO OUR READERS HERE AT AWATE……………..? I GUESS NOT ? Let me hear from you if you do not mind it. lets say this to your questions. 2. no check points in Eritrea. but check points are set in time of emergency against enemy attacks. now we are sure under control and no check points in Eritrea for the last 6 years. I go every year no check oints. but check points are even exist in a any western country- that is the cameras and that are installed on every stereet.. freedom of movement is needed in any country, but in Eritrea there are no cameras. In Ethiopia there is no freedom of movement because the streets are guarded with armed soldiers. even the markato and paisa are full of armed police, and military men. every evil comes because of woyane. if woyane was not there the Ethiopian people would have been in better position. woyane is the cancer in the region. what is happening in ogaden, in igray, in amahara, in aoromo regions. people are incarcerated , every telephone call is tapped, every movement is monitored in one or another systemtic way. Ethiopia is a police state. you better shut up and mind your business about Ethiopia.
. what a shame you speak about the best country Eritrea when you have too much sin and evil happening in your country. what a hypocrite. no peace no war is a result of woyane;s accupation of Eritrean land. woyanes amass troops to to invaDE WAR. ONE THING THE WOYANES HAVE TO DO IS ACCEPT INTERNATIONAL APPROVED BORDER, RESPECT THE LAW AND GO HOME. tHEN EVERYTHING IS NORMAL. pRESIDENT Eritrea IS THE FATHER AND CARER OF THE TIGRAY AND ETHIOPIAN PEOPLE. hE LIBERATED TIGRAYANS FROM THE DERG. nOW YOU SAY THIS AND THAT. tIGRAYANS BALAME pRESIDENT eSYAS SIMPLY BECAUSE HE IS THE FATHER OF FREEDOM, THE LEADER OF REVOLUTION, THE CAPABLE LEADER WHO LEAD eRITREANS TO INDEPENDENCE. OF COURSE WOYANES AND THEIR CADRES DO NOT LIKE HIM TO BE SEEN AS GREAT MAN. tHAT IS WHY THEY STARTED THE Wr. Meles has said it clearly in an interview, they do not want to see a strong leader in Eritrea. Meles said it once the war was a border war, then he said it wS ECONOMIC, THEN HE SAID WE DID NT WANT TO SEE STRONG Eritrea. I WILL GIVE YOU THE LINKS AND REFERENCES OF HIS INTERVIEW. NOW YOU SAY THIS AND THAT BECAUSE THAT IS THE BEST THING FOR YOU TO SAY. regime succeeded by Somalia like splinter factions. Please spare us your lies. I for one fought on the Assab front and know what Weyane wanted and failed to capture. My brothers/sisters died defending every km of the land. What are the lies I wrote? Can you mention any? Woyane never tried to capture Assab! Most PFDJ supporters are repeating the fabricated propagandas of DIA! ሕማሙ ዘይተዛረበ ፈውሲ የብሉን! It’s obvious you haven’t a clue about what happened during the border war. If you have any clue about the cause of the border, you couldn’t reach Eritrea to where it is now! One of your problem is; you consider weyane as your enemy! But the truth is, woyane was the one that saved Eritrean struggle from total annihilation during the “red star” fighting, during the “selahta werar” , during the border war & became the first to support Eritrean independence….! ….therefore, stop blaming weyane & Concentrate on the solution for your country! India has border problems,Iran & America have problems, Palestinian & Israel …. But they have been talking to solve their differences,they have constitution, economic interaction…..! but since your leaders created the border war to suppress Eritreans need for better, then they don’t want solve the border conflict! I don’t believe any Eritrean ; call them journalists, politicians ,civic servants ….have an intention to go against Eritrean interests! since 1993 Our people accomplished a lot of stuff offcourse Dawit or Johar you can hate the policy maker but stop your nonsens you need to give a credit to our people for their hard work period. One thing that should be clear to woyane, Eritreans voted 99% for free and independent Eritrea. Whether we like pfdj or not, it is our business not theirs. It is for us Eritreans to decide. woyane also said the same thing, eritreans voted 99.8%(not 99%) for free and independent eritrea. whethter eritreans like eritrea or not, it is only eritreans business not ethiopians. it is up to you eritreans to decide the future of your eritrea not ethiopians. I would like to ask the AT to retrieve the old news from Gedeb news about the disappearing,kidnapping,and horrible killings by the PFDJ Death Squads at during post-Independence so as to make my point more reasonable. -The mysterious death of another EPLF veteran,Mr.Doud Abdella–in the streets of Asmara99where he said that he committed suicide–where a fake investigation was carried out. -The mysterious death of the Director of the Arabic Eri-TV Program,where he was found dead in his office with nasty brain injury—with an axe or similar weapon,which was never investigated. -The Mysterious death of the Omo Factory–successful business man–Mr.Mohammed–from Mendefera/England,said to have died of a “Car accident”,which was never investigated. -The fate of some of the most respected heros,Eritrean has ever seen–Gen Salih Osman ,who saved Aseb form the Weyanes and aginst the order of the beast of the beasts,DIA,who tried to present to the Weynaes as a gift. -the silent demotion of Ibrahim Totil,and Senior Generals–including Gen Omer Tewil and Gen Remedan Awelyai and probably,the intelligent but nominal Defense Minister,Mr Sibaht Eferm ,likely to be replaced by the notorius Gen Philipos. Can some one clarify to me as to why we ,Eritreans,have remained silent and dumb about theses dangerous incidents? Haile the Great showed us a clip from Israel where one of the Youth clearly told us to our face that we, Eritrean people are responsible for all the mess–including the Youth exodus and the mess insdie Eritrea for not fighting for our rights inside the country—for not challenging the government about the G-13,who challenged the DIA for our rights!!! I would like to see a hot but reasonable debate on the above issues–as to why we are silent about the decimation of our heros and heroins—,please, and what to do. The only thing I can say here is woyane have served Eritrean better than the leadership in Asmara in everything way possible! Woyane never had an intention to take over Assab at all! Stop spreading the fabricated propaganda of PFDJ! Tell the truth! Ethiopia is a safe destination for Eritrean! Eritrean are getting the opportunity to follow their higher education,transit to a third country for settlement( where these individuals will benefit Eritrea after the demise of the DIA), Ethiopia accepted Eritrean being deported from Egypt ….! Woyane has done everything to help Eritrea & Eritrean , woyane should have been prized instead painting PFDJ’s fabricated propaganda! You wrote the crimes of DIA , the killing of Eritrean heroes, at the same time, you are promoting PFDJ’s fabricated propaganda! Not good! Please review what Semere Andom’s short and sweet but to the point clarification about the Weyane” Charity” saga. -The merciless deportation of more than 80,000 Ethiopians of Eritrean origin besides looting their life-long earning. -Your Weyanes-have tried every evil thing to destroy Eritrea and to keep eritreans divided by any means possible with the help of their masters—well documented facts. -Your weyanes are taking advantage in the name of refugees–thru the help of the corrupted UNHCR. I feel bad to report the above incidents but as an Eritrean,I felt that we have a moral,legal and national obligations to challenge these unchallenged and serious issues. I am just embarrassed that we remained silent about these serious National matter. to woyane and get the trust of the Ethiopian woyane than the Eritrean PFDJ. with the enemy of the people and the country as the woyanes has been doing against Eritrea. More over one who do not have freedom himself can never bring freedom to others ! with the PFDJ than to cross to the enemy line and be a servant against own country and people. Cannot agree more—as things are relative.This does not mean though, symptazing with the crimes of PFDJ,but as the last option–kind of.And trying working hard to change the situation with an internal capacity,no matter how difficult it might be. There is no perfect startegy but putting all meanses together and coordinating them for ONE Goal:Peaceful Transition of Power.BUT ..NOT the Arab Spring style though–as it has an evil intention and goal. All these tactics have been tried for Eritrea without any exaggeration. Eritrea is blocked in every corner & it’s youth is scattered all over the country in the pretext of military service! What you wrote about Weyane is all wrong & fabricated propaganda! Therefore , you want PFDJ to go while propagating it’s fabricated propaganda! The solution for Eritrea is a new idea that fits it! What you are doing , repeat fabricated propaganda hiding the truth! Promote the truth so you could find the solution! Weyane has nothing to with all the mishaps going in in Eritrea! About the G15 you kept quiet, Eritrean being killed in different pretexts, you kept quiet, Eritrean are still dying under different cases,,,,, so blaming weyane isn’t a solution at all! Weyane is still cordial with the Eritrean people ! DIA want you to talk about woyane & you are still talking his fabricated propaganda! أريتريا لقرن من الزمان .No anymore cheating Eritrean people .everyone knows SHABIA abuse Eritrean people more than all the occupants during last century . Oh yeh it applies to both . No more cheating the ETHIOPIAN people. We are all aware of your and your TPLF abuses of our people until today. or personal benefits though they point the finger only at pfdj. may be a little better than oppo. ! مؤيدي الشعبية قصيرة أو قصروها عمدا وذاكرتنا وذاكرة التاريخ لا تنسى عن درجة العلاقة الهدامة التي كانت بين الوياني و(اشقائهم )الشعبية قبل العام 1998 كانت الشعبية تخون التنظيمات الاخرى وحتى بدون أدلة اﻵن أصبح العكس أصبح للشعبية علاقة مع تاك الجماعة كان تخون من كانت له العلاقة بغض النظر عن صحتها وما هو معزز ومشمئذ من الشعبية وضع نفسها في المكان الذي يحق له كل شئ (اذا كانت مخطئة فهي على حق واذا أصابت هي على حق ويا اه من عجب أمر الشعبية. Once again, you guys are living in a false propaganda that your leader create! There is no truth to what you guys argue about! If the Ethiopian defense forces wanted to culture Eritrea as a whole, Isaias was in disarray, therefore , nobody could stop them! You guys are arguing about the fabricated propagandas created by DIA to divert the Eritrean need for for a change! These who wants to take Assab back are in bed with your leaders in Asmara! DIA wanted you to inherit his false propaganda to cover up his intentions , & that you guys are exactly doing! Himamu zeynegere medhanit ayirekbn! Finally Ethiopian & Eritrean are not enemies , but blood brothers! I know Eritrean was deported from Ethiopia for security reason, & I know so many Tigrian are disappeared & nobody knows the where about of them! Thousands of Tigrian has been disappeared in Eritrea! Thousands died in the streets of Asmara & other cities, but this didn’t & won’t break the brotherhood of the two people! We’ve got two great DJs in the house – Dawit for cartoons and Kokhobe for poems. Johar, Flip that back, and it is you. Wegiha Diya? I think you are Z one stuck in the middle of no where. I love the piece you did on Ahmed Nasser. You said, he has never laid foot in Eritrea after he left defeated in 1983. Stuck describes it well. Stuck till death do us apart. You will never see Eritrea so can you call it progress on your part and Younis. Boku, this is exactly what I don’t like about cult members like you: 1) you are proud of committing injustice, you are evil, and 2) you don’t read what is written and you always get it wrong. The interviewer was Saleh Younis, not Johar–not that it makes any difference to you. You are just hate filled and act like a true shifta that you are. I have never seen anyone who is proud of being unjust and cruel, except your cult. Do you honestly believe that? Sadly given the current discourse in the Diaspora, our communities will continue to be divided for years to come, with or without PFDJ. Do you honestly think our communities will be united once PFDJ loses power? You’re fooling yourself if you do believe that. Deki Erei, please do not fall for these crap. All they are doing is trying to solicit info from the gullible. They are lost at a loss, irrelevant and have been lying about everything with devious intentions. thyself he.she is at war. BEFORE ANYTHING ELSE LIKE UNITY OR ELSE !! figure out how to govern or trying to administer the whole country in a command chain. the situation of a country and people adding and piling up additional more problems. Case in point : Ethiopian politics, and all other post colonial African countries. This almost confirms to us what the inquisitive AT indirectly told us when the top generals died enroute to Mehmemit Festive/Memorial.Do NOT forget the issue between Gen Hanjema and DIA–despite his positive role with Gen Osman Ali–? at Aseb Front in 2000.Vanyak is simply an unsuspected straight shooter,who can out of blue shoot it on day light due to his firm principle in justice,truth andJigninet, as we all know.DIA is always paranoid of these kind of people–he cares less about their Jigninet for Eritrea(take wedi Afa’s case).This was preceeded by the–“extensive restructuring of the whole system” after the Forto incident as clearly witnessed by the EPDP members inside the country. The AT knows well the top three Generals who are being asked to step downn from their Military Service for that same and exact reason: ” Restructuring of the EDF”.The suspected people are directly and indirectly victimized but the lesss uspected ones are being demoted in a day light. Do NOT be surprised if Gen Sebhat Efrem is replaced by Gen Philipos .This is just a simple tactic that does not need one to be a Rocket Scientist to understand it. Remeber what happened to all people politically related to Ali Said Abdella–the likes of Artist Edris Mohammed Ali. it is so sad that it is so obvious and gross but nothing is being done–and it is too late now to control it as all the eilite of Eritrea have been hunted down mercilessly. Any statistics to substantiate the above claims? That fake haile, aside from his dishonesty of pretending to be someone he is not, there is actually some validity to his concern. True, what is reported in this news is not confidential for everybody knows the rampant defections and the weakening of EDF. There is nothing confidentiality about it. But in principle his concern of military secrete sensitivity is in place. Opposing EDF should not be seen as opposing the regime in Asmara. Once the current tyrannical group is gone, it is this same EDF that will continue to be EDF. A different EDF won’t be imported. Mind you, when news involving the armed forces or security organs makes it to public domain, it is most likely old and of of lower practical value. Every time a member of the conscript army cross into Ethiopia for example (an estimated 40% of the Eritrean refugees in Ethiopia are army deserters). This persons are initially debriefed by the Ethiopian army intelligence personnel before allowed to proceed with their escape plans. At that point, all of the above information and more has been shaken down from them and the Ethiopian army uses that sort of information and other sources to draw its best guess of the state of the opponent’s current standing. It is such type of exercise that enabled them to confidently attack in March 2012, declare it to the world, predict that the regime would be incapable of mustering retaliation and publicly warn it of more similar actions whenever they feel like taking one. In 1998, when the Eritrean defense forces were considered a national force (unlike now, in service of private individuals), it was a strong army with popular support. Ethiopia had to move out the entire Bole airport to Nairobi for safety reasons during the early stages of the conflict. Today, it is far far different. They don’t even move out locally grazing cattle in the border area. Where do you think that sort of confidence came from? So, articles like the above are accurate and topical public coverage, they don’t really affect the balance of power on the ground per se. So if EDF was much stronger before the 1998-2000 war, and everyone agrees it was stronger, what were the main contributing factors for its ultimate decline of the present time? And what happened to the legendary Ghedli era EPLF military intelligence units that we heard so much about? Did the dictator’s absolute power grab required for them to be deliberately dismantled? Were the G-15 the brains of EDF and with their liquidation everything went downhill? How am I the fake haile when my name is haile? How will this affect the security and sovereignty of Eritrea? No matter your take on this I still [lead with you as a reader to keep at the good job you have been doing against the PFDJ, the enemy of all humanity. The PFDJ military, yes those who cross dress in “kemish” are endangering the security and honor of our country, 14 years after the war ended, Ethiopian still occupies our land, EDF is impotent and as Eritreans they are our blood brothers,our kin and kith but they are goons who are serving our tormentors. Awate took pains to report the martyrs files to avoid leaking national security information in the past. Hope you got the discrepancy here, this is not a comment from me (another case of the guy who made it through when the moderator was on his break). Anyway, my view is far from the comment you responded to. Eritrean defense capability doesn’t depend on bad press, rather it was degraded through policy that has been in effect for a decade and half (before that the regime had the decency to do its dirty job in hiding unlike now, in your face type). Following the UN comprehensive arms embargo under chapter VII, Eritrea has no longer any meaningful combat capability against any conventional army. The EDF wouldn’t be able to replace basic parts and pieces under it can dig tunnels to the Sudan. Because all it takes it to cut off the Sudan and the whole fighting force would disperse in disarray (Sudan is the only viable clandestine supply route). But you know how Al Bashir stab Qaddafi in the back and IA is well aware of that don’t think he would count much on him. Sadly, there is no rewind button, there is NO WAY things would get better without change of government and the longer the regime lingers on the greater the chances of complete disintegration and an advent of intractable chaos in the country. Those who think that this is reason to give the regime a chance, that is just wishful thinking. The regime not only have exhausted its external sources to stay but also bankrupted its internal pillars and therefore it is a done deal. Dawit the cartoonist is doing a good job. Political cartoons explains the current political discourse by displaying the actors and their messages in an image form. Dawit has a good grip in this category. So he must be encouraged by all good wishers. Viva Dawit. Thanks for the kind words. As time permits, I will try to keep expressing political opinions in two or three dimensional ( yet satirical) visual art. Dawit, I am asking your permission to copy and improve your turtle cartoon. It is excellent and I couldn’t resist it. Yes, by all means. Please go ahead and use it as you see fit. I am glad you like it. …and wouldn’t it help if you add a a 1 or ! or U (for a u turn) to avoid confusion with me “haile” (known to some as haile the great, the toothless or the coward depending on their outlook of hgdef). It is ok haile, the end justifies the means. Because of this soon you might be without pfdj. What’s the scoop with the two generals (Vainak and Hanjema) and Mr. Dessu? I have several questions. 1. When and where were they last seen alive? 2. Any police reports? Pictures of the vehicle and scene? 4. Condition of the rumored fourth person? 5. During the reassignment recently, did the status of these men change? Did they resist anything? This ‘accident’ has IA’s hands all over it. If he is going to kill you sooner or later, why not take him out first? I get baffled by how this idiot can outwit an army full of men and women. Sheba, just like you did the other day, I had you in mind when I was writing those questions. I was going to ask much more difficult questions but I was afraid nobody would care to read. I am always the first one to defend the AT but this one is a little shallow by their standards. That’s as much as I can criticize this team. They are too good and they deserve a break here and there. A devout PFDJ supporter and insider was telling me the other day that the accident happened as they were driving fast and they ran over a pot hole. To me that’s a clue. Throughout his adult life, IA has vanquished so many people who he thinks are a threat. That’s no secret. We need to dig deeper on this one. What was the relationship between these generals and Phillipos? Were they popular within the army and the public in general? Have they been hanging out together much more frequently than usual? Is there any reason to suspect that they may have done anything extraordinary during the celebration of nadew iz? Did they go to other celebrations together, like fenkil? If so, why was this time chosen if there is any foul play? Saba, you never fail to impress me with your sharp comments. My only grief is that you don’t go into lengths to explain your claims, which I think are generally true. SWUR ginbar 2.0, that is an incredibly smart remark. I would hope you can elaborate more on that. See, you have been accusing me for not being more inquisitive and suspicious but I am naive and I don’t usually read between the lines the way you do. But you have been keeping me on my toes here lately. You know a lot but again please take a little extra time and educate us on your sharp comments. Well, you may find this not surprising but I have read pretty much everything about Sherlock Homes. To your surprise, the very first one I read was a translated version in Amharic. Really enlightening to read. The one I will never forget is የቀይ ራሶች ማህበር. Try to see if Eyob can find it for you. That’s where I get my investigative skills. Sorry for the lack of humility here lol. Lastly, those questions I was asking – whom do we ask those to? I agree with you that i am not good at lengthy explanation. I am good at making conclusion from something that looks complex. In real life, people like me when i spoon feed them with my short summary but then hate me for not further explaining them:) It takes me time and a lot research to prepare something the way i like it. Eritrean politics is so toxic that i refrain to invest heavily. I can say that you are a good person, you can not tolerate injustices when you see them but you barely see them coming because you are too nice:) So “lewah Ermi afra mesiluka keytireghits selmi”, from yemane barya derfi. To make your investigative skills from “sherlock Homes” effective in politics, detach yourself from the opposition groups and focus more on what is best for your people. Your investigative skills can answer those questions but it will require you funds and dedication, so do you think it is worth doing that? Hi Ermias, yesterday i wrote you a reply but somehow it is lost and i do not see it posted. Hi sabi. I saw your beautiful message indeed but I have had a crazy weekend to reply. Specially today, tsebel keydelki maat swan hilbetn eyu. Your message didn’t get posted but I saw it on disqus. You are too kind to me. We all need random kind people in our lives and I guess I found that in you and Hayat. I will reread your swur ginbar analysis to understand it better. One last thing, I wish you could sign up on disqus so I can track your inquisitive posts more easily. Plus you need to work your way into making it to the whitelist. To the point Saba.The disgusting thing is that no body cares despite all these facts on the ground—As Eritreans,we are so dumb and dumb for not figuring it out and taking an appropriate and timely action—We only know fighting among each other,insulting each other, character assasination of each other– and the Gobiye and the Ghemel keeps marching—-ahhh,it is so saddening–I just hate sometimes for being ” Eritrean”–simply for being a victim of such a devil and beast!!! I have an uncle,a former Security Chief in ELF,who did the best job like all Eritreans heros during the 1998-2000 Ethio-Eritrean War where he achieved the most sensitive security success stories by acting like an Arab Citizen with an Arab Nation Passport,and was roaming around Addis City besides smuggling all the SAM-7 anti-air-craft missiles/Stingers. Guess what happenned to him? Since he was a close associate of Petros Solomon,who immediately promoted my uncle to a full 5* Colonel for his achievement,DIA made sure that this guy should be stoned to death!!! !This is a FACT! So, no surprise about the fate of Wedi Afa and other heros during the liberation struggle and now the likes of G-13,Ali Seid Abdela,Abdella Dawid,Idris Wedi Arre, the Omo Businees owner,who died of a “car accident”,the director of Arabic Program of Eri-TV/Dimtsi Hafash(died of nasty brain injury with an axe in his office!! !Not to mention the guy who was stabbed to death in his own home or office(Senior EPLF Officer then a Diplomat). The freezing/demoting of Mr Romedan Mohammed Nur for life on a day light would have been enough evidence but we,Eritreans, are dumb to that extent. 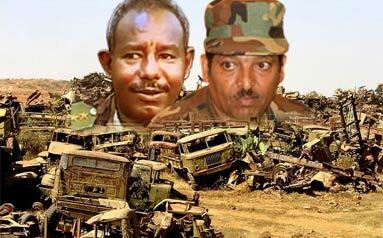 DIA knows that Gen Hanjeam and Gen Vanyak are few of the only remaining jeganu who could potentially challenge him and he had to hunt them down before it was too late due to his paranoia about wedi Ali’s attempt/Forto Incident; and do NOT forget the fate of wedi Ali’s boss, Gen Saleh Osman–the hero who saved Aseb–along with Gen Hanjema. What else do you need to prove me wrong? Lies, lies in all sizes.